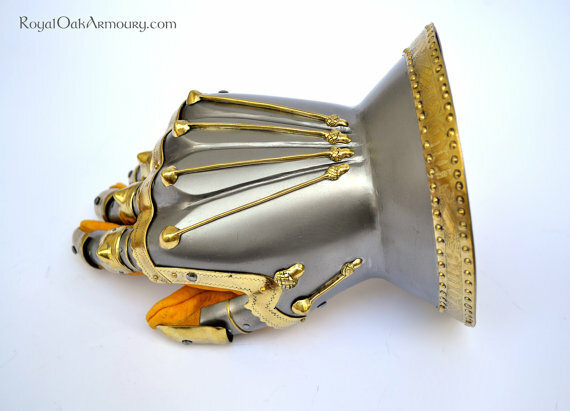 A pair of gauntlets in the hourglass form of the 14th century. Their general construction is based on contemporary artwork and a selection or remaining artifacts, and the princely embellishment takes its inspiration from several sources. These gauntlets exemplify the jewellery-like quality of early plate armours, which embody the technical and artistic repertoire of their craftsmen and the exuberant taste and wealth of the patrons who commissioned and wore them. The acorn motif which decorates and reinforces the metacarpal protection is based on an example in the Museo Nazionale del Bargello, Florence, as is the wiggle-work and decorative file-work across the knuckles. 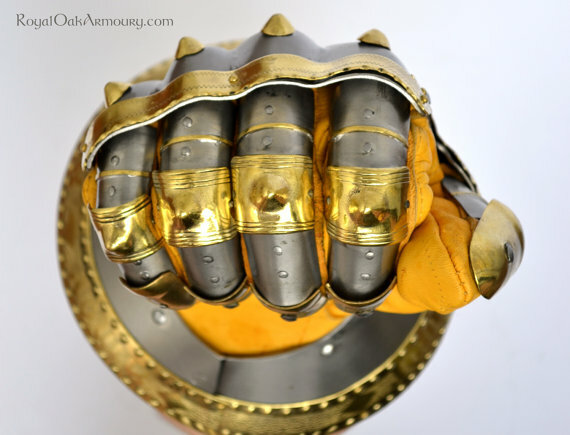 The brass trim on the cuff is etched, punched, and chased in an “amour” motif based on the 14th century gauntlets in the Wallace collection. Construction of the spiked gadlings and other finger elements is based on the funerary achievements and effigy of Edward, the Black Prince, in Canterbury Cathedral. 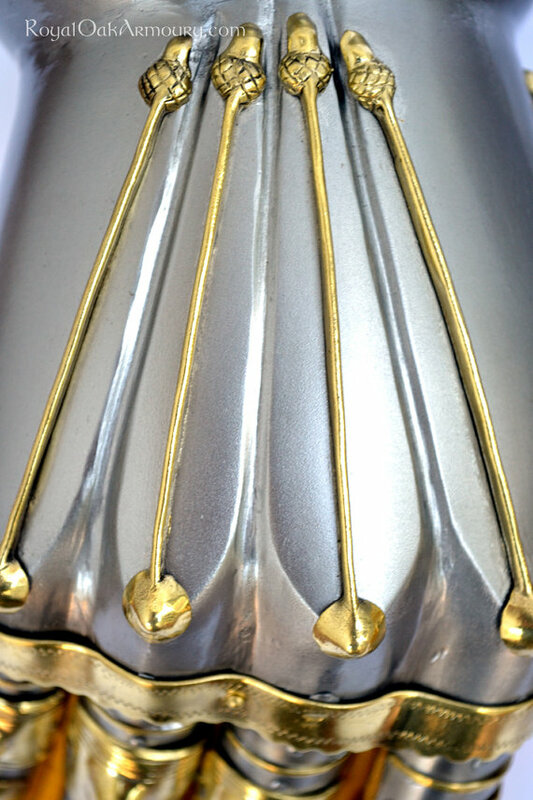 In our version the body of the gauntlet has been hot-raised from a single plate of 16 gauge steel. Finger elements are constructed of 20 gauge steel and brass, and permit excellent freedom of movement without binding, pinching, or gapping. Every individual plate is cut and formed to fit a specific joint, carefully measured from the traced outline of a hand provided. Finger plates are then riveted to thin, elastic goatskin which is in turn attached to a high-quality deerskin glove. 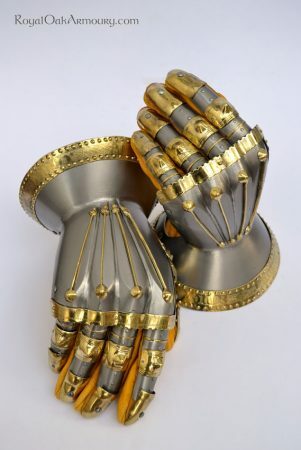 Custom inscriptions and different decorative motifs are possible on request, as are serviceable gauntlets with reduced or removed embellishment. A traced outline of either hand with a measurement to ensure accurate scale should accompany an order for these gauntlets.